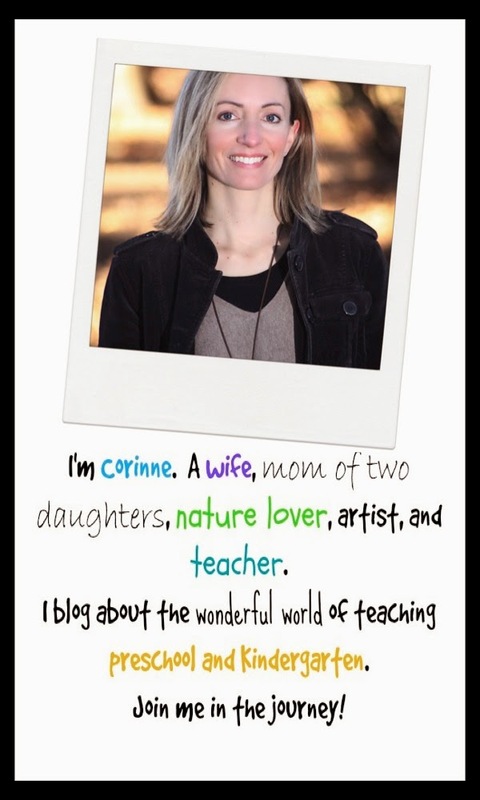 Teach Easy Resources: How Can You Encourage Preschoolers to be Empathetic? How Can You Encourage Preschoolers to be Empathetic? I broached the topic by introducing the concept of the Wrinkled Heart. We begin by talking about how the things we do or say can make people's hearts feel happy or sad. Then we brainstorm specific things that could make a heart feel sad or "wrinkled." For every idea the children give me, I make a fold in a large paper heart. Once the heart is filled with folds, I open it up again and we take a look at it. We discuss how wrinkled it is now that its feelings have been hurt so many times. 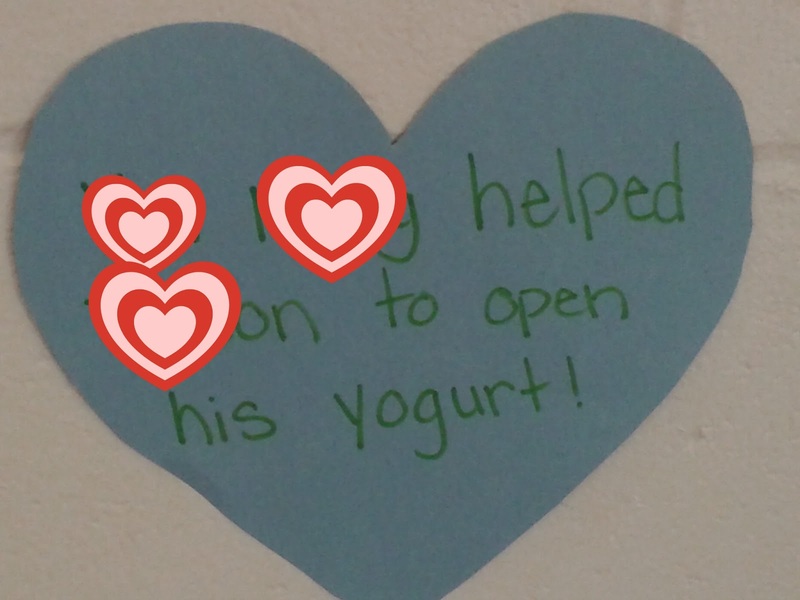 The students are then asked to say, "Sorry" to the heart like we do when we have hurt a friend's feelings. After saying "sorry," we take another look at the heart. I ask the children if the heart looks any different now that we have said "sorry" to it. Is it smooth and new looking again? No. Everyone will agree that it is still wrinkled. I tell the children that although a wrinkled heart may forgive us, it will not be as new and smooth as before. We must try our best not to wrinkle it in the first place, and instead do things that will make it happy. 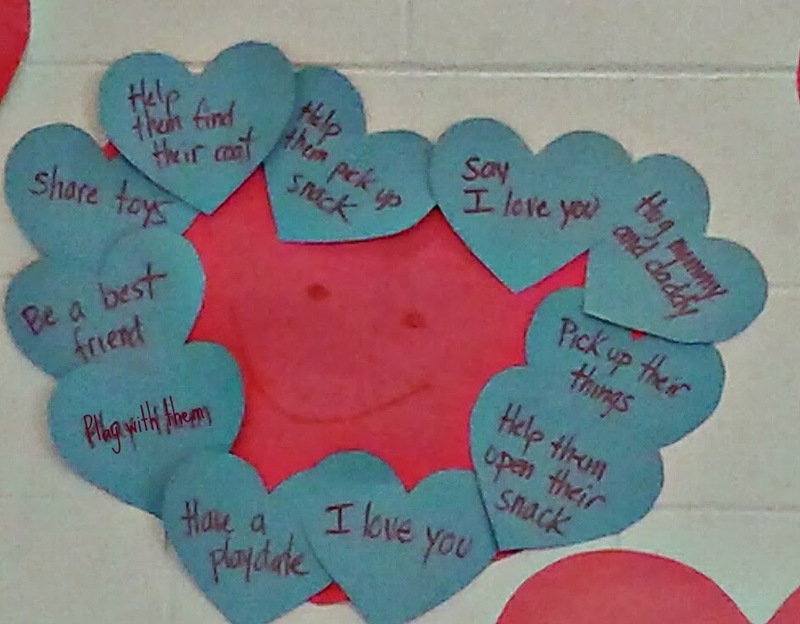 Here are some of the children's ideas for how to make someone's heart feel happy. My co-teacher and I follow up this lesson by letting the children know that we will be writing down all of the instances of caring that we see in the classroom this month. Here are two of the hearts that we filled out today. 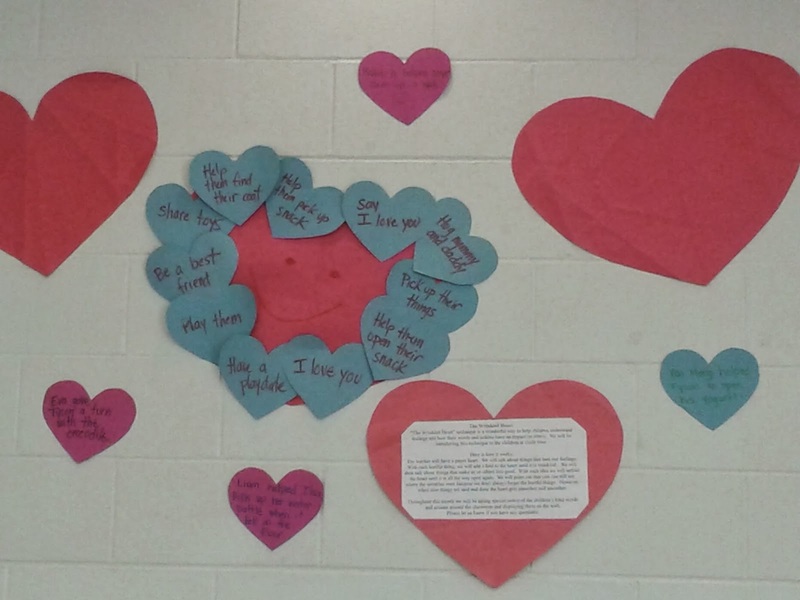 We displaying our collection of "good deed hearts" on our wall along with our wrinkled and happy hearts. 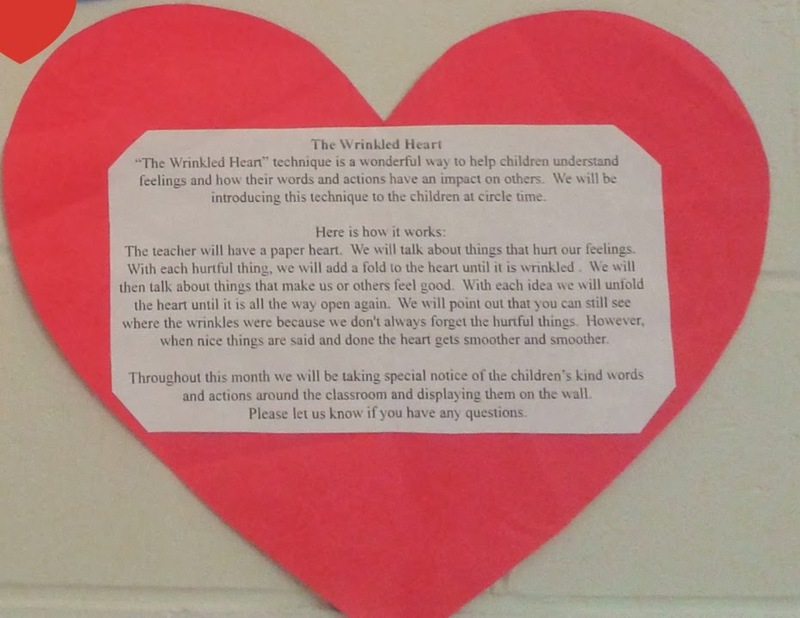 Here is a close-up of the wrinkled heart lesson that is posted on our wall for parents to read. 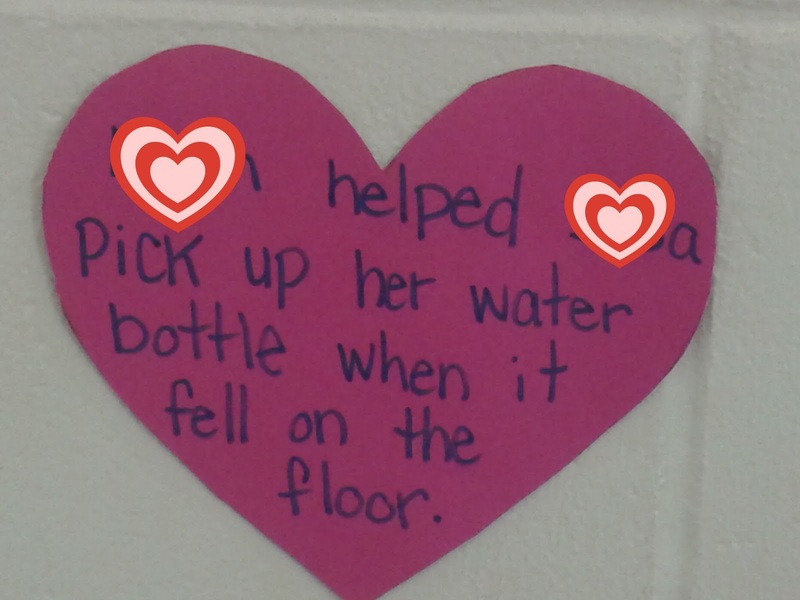 We hope to have our wall filled with "good deed" hearts by the end of the month!